The Robins Nest Forum • View topic - Winchester move confirmed. Post subject: Winchester move confirmed. By Stroud News and Journal. Post subject: Re: Winchester move confirmed. It’s ‘confirmed’ but the SNJ only ‘understands’. In the end just another money grabbing tw@t.
Or, to put it another way, professional person moves job for higher salary. I am mystified why footballers are continually castigated for seeking more money when, for nearly everyone else in society, such behaviour is fine. Absolutely. Don't blame the guy if FGR are throwing money at him. He's not Cheltenham Town through and through, so is going to go to the highest bidder and possibly the place where he believes he'll be most successful. Not so clear cut. E.g. one may be offered a higher salary at a job which will be a sideways move in your career and with worse long term prospects, and decide that actually in five years you would like to be in a position for further promotions and salary increases, which you won’t get if you move and stagnate. Expect Winchester to be a lot chubbier and less fit in six months, and then playing for a non-league or Scottish League side in two years - for less money than we are offering him. As stated, he obviously has no ambition to play international football. Good luck to Winny I say. Certainly no hard feelings from me. How can anyone not have hard feelings to him???? Doesn't change the fact that he's a snake. Hope he gets more than his fair share of boo's when he returns and can lead them successfully to the conference. Where they belong. Put yourself in his shoes and ask yourself if you'd turn down a (I assume) large pay rise at a rival company for an identical role (or better if he's played in his preferred position), that was only ~20 miles away from your current job. It's easy to call him a traitor and all that, but I would suspect many in here would do the same thing if you were in his shoes. I can't say I'm not disappointed with his decision, however that doesn't instantly make him a traitor in my eyes. Last edited by Johnsons Red Army on 30 May 2018, 22:45, edited 2 times in total. I always find it amusing this notion of player loyalty. He quite rightly does what he feels is best for him. When a player is released in the summer supporters never say 'the club has shown no loyalty to the player' because, quite rightly, the manager is doing what he feels is best for the club. Works both ways. Its not a step up is it, if he goes up to a league one club fair game. And he was offered a new deal here. So no. He isn't loyal. He's simply moved for the money. That's exactly the point - he's moved for the money. He's done what the vast majority of people would do if they were offered more money. Del Boy's point is a great one - when players are released we're, told on here that there's no room for sentimentality. When a player decides to earn more money elsewhere, he's a traitor or a snake. If this was in the upper echelons of football, I'd probably agree because the players are probably on stupid money already, but at League 2 level, the wages are not as great and the player has to do what's right for him and his family in his short playing career. There is no loyalty in football aside from supporters. Players, managers and staff move around when it suits them and I can't say I blame them. Doesn't really matter if it's a step up - he thinks it right for him. Sad thing is he was/is one of our best players so to lose him is disappointing. I wish they’d stop using the word ‘captain’ in their headlines. He wasn’t the captain. He wore the armband for how ever many games in a ploy to and bribe him into signing a new contract. Certainly wasn’t leadership material and his performances tailed off a long with his effort and fitness. We can’t say we weren’t warned by Oldham fans. He was good on the ball, and at playing short clever passes. But let’s not kid ourselves he isn’t in the McCann or Pack bracket. He stood out in a very underwhelming season, does that really deserve our ‘best ever contract’ If FGR want to spend a fortune on him, then good luck to them both. We move on. I disagree. In my view, CW was a very good player for us - regardless of the quality of players around him. He rarely gave the ball away and very few of his passes were wasted. He was versatile and often wasn't played in his best position because he covered for injuries, etc. He also had a good shot and scored some very decent goals along with providing some great assists. Yes, he tailed off a bit in his last few games, but that shouldn't detract too much from the numerous good shifts he put in for Cheltenham. I wish him well and while I'm sorry he's leaving (especially to FGR), you can't blame him for accepting a better offer. As others have said, it's a short career and he's only doing what most would do if faced with the same situation. I am not saying he wasn’t a good player, I just don’t think it’s the end of the world. I also don’t question why he’s going, although he was offered ‘the best contract in CTFC history’. I am far more excited and interested in the new players who want to be here. The real loss will be Mo. He’s irreplaceable. Good luck to him. Absolutely no issue with him moving for the money, we would all do the exact same and you're a liar if you say otherwise. I personally don’t care what his reasons are, the only relevant fact is that he doesn’t want to be here. And nope not true. I have turned down much higher monetary ‘offers’ in the past and no doubt will do again in the future. It’s not the moving for the money or moving to a rival which is the problem, it’s the short-term thinking and career stalling I am criticising. He stays here for a year or two. Yes, less money but then he keeps improving and getting fitter and moves to L1 for more money, and featuring in the NI team. Under Cooper it’s going to be the reverse. He’ll be a few stone heavier by the end of the season and after two years will be loaned or released to non-League or Scottish League, for less money. Winchester might be happy with that and good luck to him. That’s not the attitude or lack of drive we want at our club anyway! Oh, I quite agree. There’s definitely a valid discussion to be had about this as a wise, or not, career move. But the money-grabbing accusations are coming from people with less subtle and nuanced views as you RCS. Putting it that way, then I essentially agree. Of course, wages are constantly spiralling in football, so the fact that he's been offered 'the best contract in CTFC history' cannot be compared to contracts offered to arguably better players in bygone years. It goes without saying that I'm totally with you regarding Mo. ... I should've added that, if he no longer wants to be here, then of course it's in everyone's interests that he moves on poste haste. My original point related to the majority of his performances while he wore a CTFC shirt. Good luck to the lad, could never fault his effort whilst at CTFC and he is clearly moving onwards and upwards. Forest Green have got themselves a top player and Winchester has clearly bought into the ambition ahead of CTFC. I am sure most of us will wish him well and give him a positive reception when he returns next season. Onwards and upwards. Lol. Career stagnation more like. Upon discussing said situation with one of my alma mater cohorts, Lord Elpym, we believe that young Master Winchester has been badly advised and that our neighbours have taken a substantial risk in offering the kind of deal that has clearly turned Winchester’s head. It is indeed an unambitious sideways move. Winchester’s salary will provide a benchmark for FGR’s existing players and new recruits to expect or demand larger salaries. Agents will be very aware. Paying the salaries that are clearly way in excess of what CTFC have said was their best ever salary offer, indicates the levels of salary that FGR are prepared to throw at potential recruits. This signing by FGR has probably been orchestrated in an attempt to undermine CTFC over the summer break - but they have massively miscalculated, because Mr Johnson has stolen a march and taken the initiative by already making decisive moves on his new recruitment, leaving FGR trailing behind with what they believe is their major ‘trophy’ signing. Mr Johnson has moved on and will not rue the departure of Winchester. Winchester is a decent enough player at League 2 level, but not outstanding, otherwise bigger and better clubs than FGR would have been in for him. And on the subject of salary escalation at FGR, the Financial Fair Play rules will curtail any further ‘trophy’ signings, and they are going to need more than Winchester and a non league goalkeeper to make a serious assault on League 2. Obviously not happy with the move - but I’ll get over it. However, very disappointed that we invested such a good song in him for it for it to all to go to waste. Unfortunately fgr fans lack the creativity to come up with such a work so unlucky Winnie. Apparently FGR do not pay big wages, it's likely his monthly wage is lower than at CTFC. They get around this and comply with FFP by offering huge signing on fees, rumours suggest Winchester got six figures. Money v Ambition. 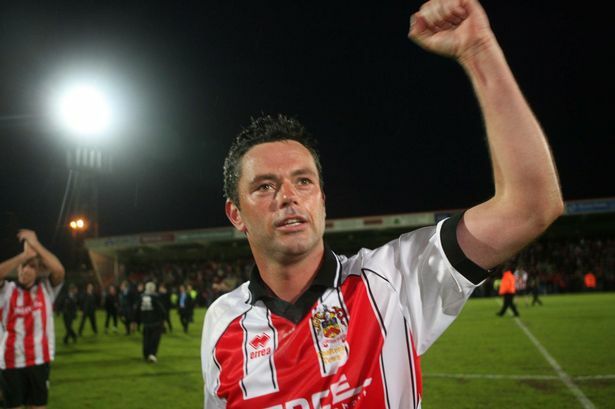 He's gone for the money, whether FGR will challenge for promotion remains to be seen. I guess if he invests wisely it won’t matter if he is fat and in non-league in two years. The rules are also to prevent “financial doping” where rich owners can pump in vast sums in fees and wages totally unrelated to real income to gain an edge on their rivals. Bottom line is that FGR are £Millions in debt. The rules can be easily bent though, they simply compare the wage bill versus revenue don't include transfer fees, signing on and certain bonuses. This is how clubs like Chelsea, PSG, Man City, Man Utd, Real Madrid get round it and I believe same applies to FGR. The career of a footballer is short term compared to other jobs and players, in many cases, have to consider their families welfare and future not the loyalty to the fans and the club. How would the punters feel if the price of season tickets and turnstile prices went up to ensure certain players stayed at the club? Would the fans loyalty extend to forking out more cash? I doubt it, so why criticise a player for wishing to improve his financial situation. I think we could all identify players and indeed teams, that we would be prepared to pay extra to keep together. The qualification for that was they bled CTFC and produced the goods on the pitch.